Did Oprah Endorse a Made-Up Holocaust Memoir? When all the outlandish claims in Misha Defonseca’s ridiculous Holocaust memoir Misha almost slipped by unnoticed earlier this year, Herman Rosenblat probably thought he could put anything he wanted to into his ridiculous Holocaust memoir, just so long as he didn’t claim he was raised by wolves or something (which Defonseca did, hilariously). But he might’ve been mistaken! 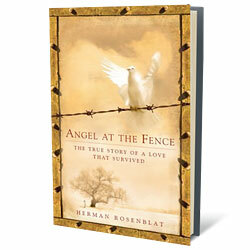 The New Republic has just posted an investigation into Rosenblat’s upcoming biography, Angel at the Fence: The True Story of a Love That Survived, in which the retired TV repairman claims he was kept alive during his stay in the Buchenwald concentration camp by a girl who slipped him food through the fence, and whom he subsequently married years later after meeting her on a blind date (“The single greatest love story, in 22 years of doing this show, we’ve ever told on the air,” says Oprah, who’s had him on her show twice). As it turns out, though, it’s possible that none of this even happened. Reps from Penguin, Rosenblat’s publisher, insist his story has been fact-checked, as does Harris Salomon, the president of Atlantic Overseas Pictures, who’s producing a $25 million film based on Angel at the Fence. Even so, we can’t imagine Oprah will be too pleased to hear about this.